i have a simple map that contain 3 layers . When i click zoom to fit then the rendering show there is some items i need to delete to have a right rendering ( want boundingbox around blue ). Because the map is simple i can easy see ( with my eyes) where are elements that make the zoom to fit big . Now i have map with more type of layers and more rows . What is the best way to do to select the elements that make the bounding box area so big ? 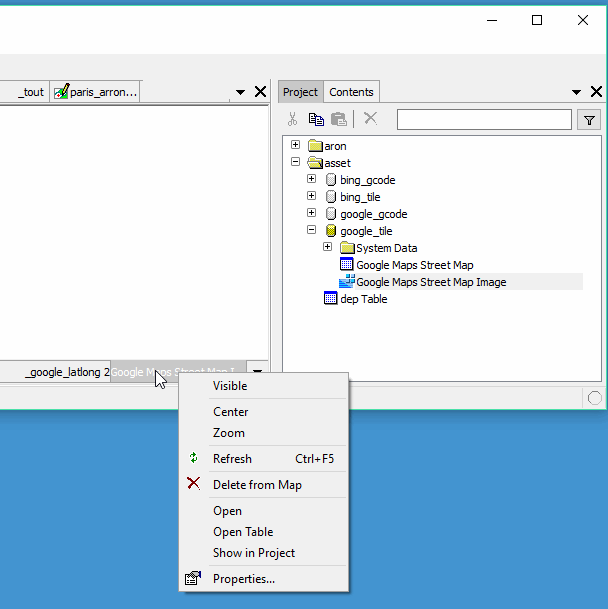 The tricky case is when label has no content and place in the map component file ( not map file extension) . What is the best way to do to select the elements that make the bounding box area so big ? I would translate that into "I want to simplify a layer to eliminate items far outside my area of interest." This is a common task, for example, in the case of a small European country that may have island possessions far away from Europe. To take a historic example, Portugal + Macao. Opening a layer that has the country, one is surprised to see it zoom to the whole world. Why? Because a tiny area far from Europe is in the layer as well. 1. Click on the layer to be simplified. 2. Zoom in to the area of interest. 3. Select everything there using Ctrl-click and drag to draw a selection box that covers the area of interest. 4. Click Ctrl-I to invert the selection. You now have selected everything outside the area of interest. The above, of course, assumes your objects are not multi-branched. If Portugal + Macao seemed to be two areas but in fact were one, multi-branched area, then selecting mainland Portugal would also select the Macao portion as well. If you are dealing with multi-branched areas, first decompose to branches and then the above steps will work. You see this effect frequently when working with maps of France, since France has so many overseas possessions. It's not just French possessions in the Pacific, it is also surprises like Saint Pierre and Miquelon just off the coast of Canada, so when you zoom to France you end up with the entire North Atlantic as well. :-) C'est la vie! i was aware of french possession issues and island around the territory of metropolitan France and i know the Ctrl-I Ctrl-A ( paint use Ctrl D "deselect all" ). Since manifold 9 don't show us what is selected or not (use red color but not status number) I do not know what happens when I try to select items . My question was in a map context and i can't select all the items in inside all layers inside a drag area create by mouse . When we open a map that have many layers we can only click on one layer at once ( click on tab of items ). 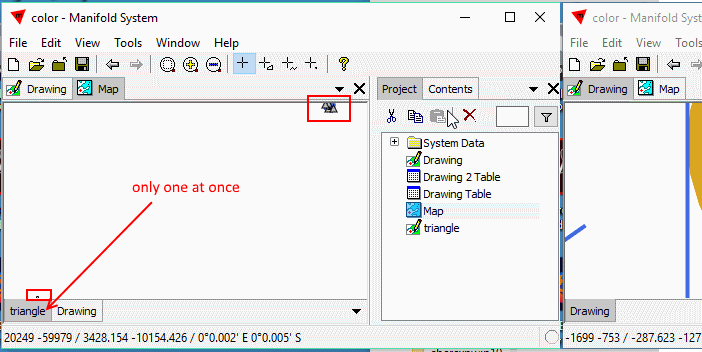 In a way when open drawing a tab of one item appear call drawing but for map item call MAp there is no tab item call Map that perhaps ll let us query wor like all the items ll be in one compound compoment ( that let us query work on all the layers at once ) . Because manifold resize all drawing to be visible by eyes we guess there is some small items in the edge of map but with many layers it is more complex . I ll try to re open my project and see if some black area appear near the edge after choose zoom to fit . is there a way by create an empty drawing and label place inside a complex map to transfer all the data contain in the map ( inside the layers ) to those empty layers ? We will try to show whether or not the layer contains selected objects, and show the number of selected objects if it is available. Yes. Create a new drawing and add it to your map. Switch to the layer you want to move data from. 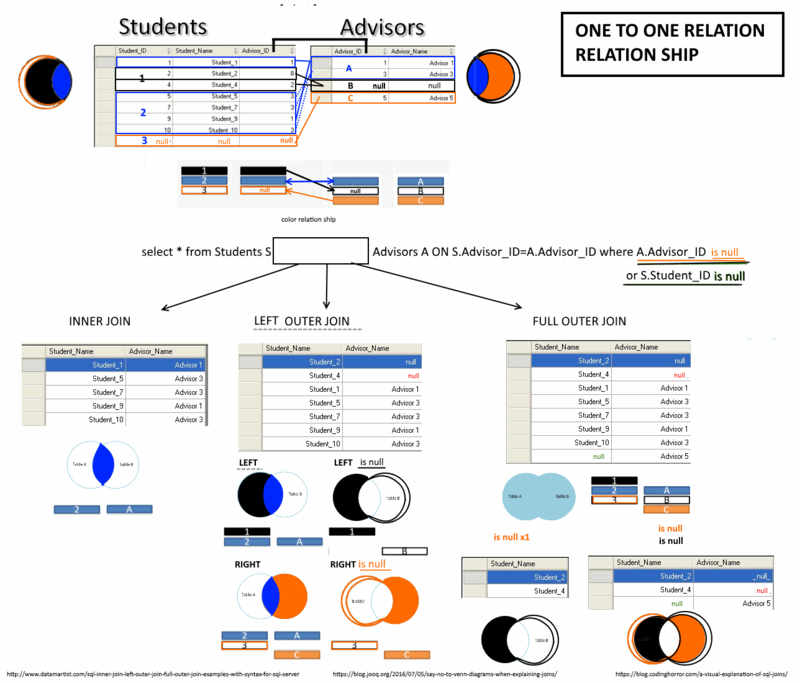 Select the data you want to keep and invert selection. Then do Edit - Cut, switch to the new layer and do Edit - Paste. Regarding finding out which layer contains objects that make the bounding box huge - you could try zooming to each layer to quickly see which of them have strangely large bounding boxes. by open and delete each layer locate in the map i could find out where the problem came from. when "Google maps Street Map image" raster is slide inside a map then the bounding box or area of interest using "Zoom to fit " don't work the way i think it should work !! In a way it is logic, the google layer bounding box is the world and i don't know if we can reduce the boundingbox of google raster. Set the google image layer to not visible don't change the behaviour of "Zoom to fit" . 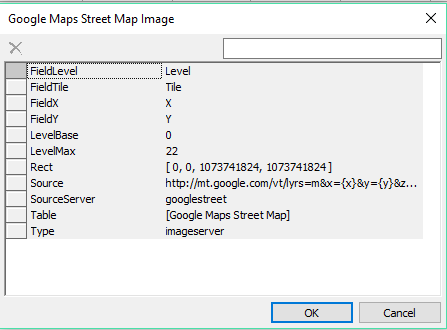 The only way is to remove google image layer locate in the map( component) !! perhaps we can modify by hand some properties of google map . I am guessing you are looking at the Rect property of the image on Google Maps. That's the number of pixels (in a single dimension) in the virtual image that the dataport exposes.